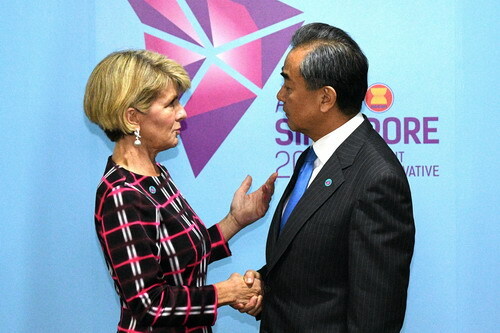 On August 4, 2018, State Councilor and Foreign Minister Wang Yi met at request with Foreign Minister Julie Bishop of Australia on the sidelines of the Foreign Ministers' Meetings on East Asia Cooperation in Singapore. Wang Yi expressed that it is necessary for China and Australia, both as important countries in the Asian-Pacific region, to conduct bilateral communication by making use of multilateral meetings and other occasions. China always adheres to the path of peaceful development and upholds the opening-up strategy featuring mutual benefit and win-win results. The Chinese side has never interfered in the internal affairs of other countries and will never carry out the so-called infiltration in other countries. As China and Australia have neither historical grievances nor conflict of fundamental interests, the two countries should complement each other's strengths, and achieve mutual benefit and win-win results. It is hoped that the Australian side will meet the Chinese side halfway, take an objective view on China's development, truly regards China's development as an opportunity rather than a threat, and do more things that are conducive to enhancing mutual trust and cooperation between the two sides, so as to create favorable conditions and a sound public opinion environment for the improvement and development of China-Australia relations. Such gestures not only conform to the interests of the two peoples, but also are conducive to regional peace and stability. Julie Bishop noted that the Australian side attaches importance to its relations with China, and stands ready to take an objective view on China's development and Australia-China relations, and further send a positive signal in this regard. The Australian side hopes to, together with the Chinese side, strengthen communication, conduct candid exchanges and enhance understanding and mutual trust, so as to promote the recovery and development of cooperation between Australia and China in various fields as soon as possible. The Australian side opposes protectionism, calls for safeguarding rules of the World Trade Organization, and stands ready to strengthen cooperation with the Chinese side to promote the negotiation on the Regional Comprehensive Economic Partnership agreement and the process of regional economic integration.